Become a part of a network of more than 11,000 professionals in the stormwater field! By becoming a part of the network, you will have the opportunity to communicate with your peers who share the same interests as you do. As a member, you will receive our monthly e-newsletter, “The Stormwater Scoop” which will keep you up to date on CSN projects, stormwater news, design tools, technical bulletins and other happenings in the stormwater world. In addition, you will get preferred access to all of our online resources and webcasts where you can keep up with the latest technical information in our fast changing field. 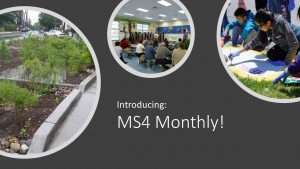 You can also sign up for “MS4 Monthly”, a supplemental newsletter geared specifically towards providing resources for local goverments and those that help support their stormwater programs! For more information and to sign up, click the image below! Sign Up to Join the Network!